All the eligible candidates should have to visit RSMSSB website to apply in the laboratory assistant recruitment. The Selection of the capable candidates will depend on their performance in the selection rounds organize by the Association such as written examination and verification of documents. All the information of RSMSSB Laboratory assistant jobs 2016 similar to Eligibility, Pay band, Selection criteria, Fee, dates, and procedure to apply are obtainable at Sarkari Naukri website. 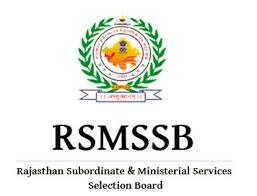 If you are interested to any of above posts then can apply of the official website of RSMSSB at rsmssb.rajasthan.gov.in also candidate can check Application format here.